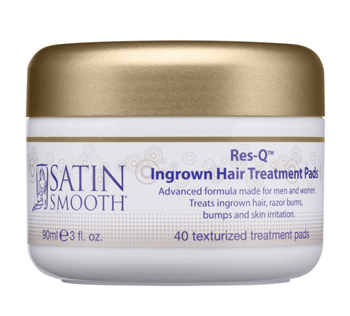 Satin Smooth® Res-Q™ Ingrown Hair Treatment Pads deliver ultimate comfort; healing razor burn, irritated skin due to waxing, electrolysis, lasers or shaving. Enriched with antioxidants and calming extracts, restores skins pH level leaving your skin beautifully soft as silk. Use Res-Q™ Advance Ingrown Hair Treatment Pads 24 hours after hair removal. Apply pad to skin in a circular motion to lift trapped oil and skin within pores.